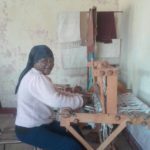 True to Herold Meander’s heart of offering a real farm experience and restoring the community’s heritage, you will find the original spinning and weaving equipment in full use again! 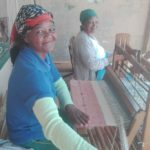 Aunt Skapie and Aunt Meisie have over 70 years of experience between them, and one can find these ladies making use of the 3 spindle wheels, 2 weaving frames and 4 weaving tables to produce the most exquisite mats, runners and cushions. They are sharing their skills with other farm employees, and lessons continue whether inside the “Old Hostel” building or on the stoep outside of a sunny day! Plain and coloured goat and sheep hair are spun here and can be purchased, along with the woven products in the shop. From 1 December 2016 Herold Meander’s Padstal will be open to the public from 9am – 5pm everyday. For further information contact 044 873-5333 or info@heroldmeander.co.za. Entrance to the premises and use of facilities and activities are at your own risk and the Owner and/or Herald Meander (Pty) Ltd and/or any of its employees, management, and contractors shall not be held liable for any bodily harm, loss, injury and/or damage to property you may suffer, due to any reason whatsoever.